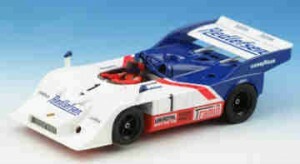 From Slot It: Nissan R390 FT1 – Lemans 1998 driven by the team of Nielsen, Lagorce and Krumm. $64.99 Sica14C. The Nissan R390 GT1 was a racing car built to compete in the Le Mans 24 Hours in 1997 and 1998; it was developed by Niamo and Tom Walkinshaw Racing Team. 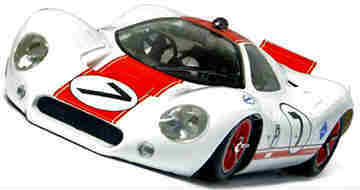 The 1997 model was modified for the 1998 race to generate more dowforce, thanks to a longer tail. All of the four Nissan R390 GT1s finished the race, in 3rd, 5th, 8th and 10th position. From Scalextric: Ford Mustang C3434 Revetlow/Petty Racing, high detail, $54.99 This 1969 Ford Mustang Boss 302 was built into a race car for the 1970s Trans Am Series by Paul Pettey and Richard Reventlow . 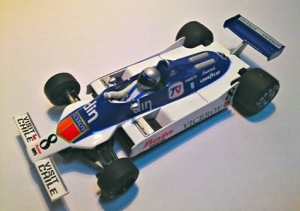 Currently owned by Ken Adams and entered in many vintage races, the Mustang has been completely restored back to its original form that it took back in its The actual slot car is much less purple, otherwise as pictured. McLaren MP4-12C United Autosports, full feature, head and tail lights, DPR, $54.99 United Autosports is an American owned, British-based sports car racing team founded by drivers and entrepreneurs, American Zak Brown and Briton Richard Dean. 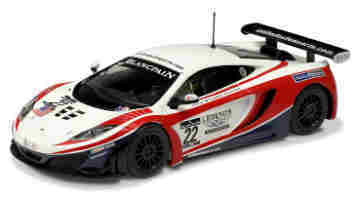 The team fields two McLaren MP4-12C GT3 sports cars and an Audi R8 Ultra sports cars in the British GT Championship.